Auntie Anne’s — Buy one heart-shaped pretzel and get another for free on Thursday when you present this coupon. Boston Market — Get $5 off a family meal or enjoy two Rotisserie Prime Rib meals for $29.99. Make sure to present this coupon to get the deal. California Pizza Kitchen — Participating CPK locations are offering one appetizer, two entrees, and one dessert for $35 from February 13-17. 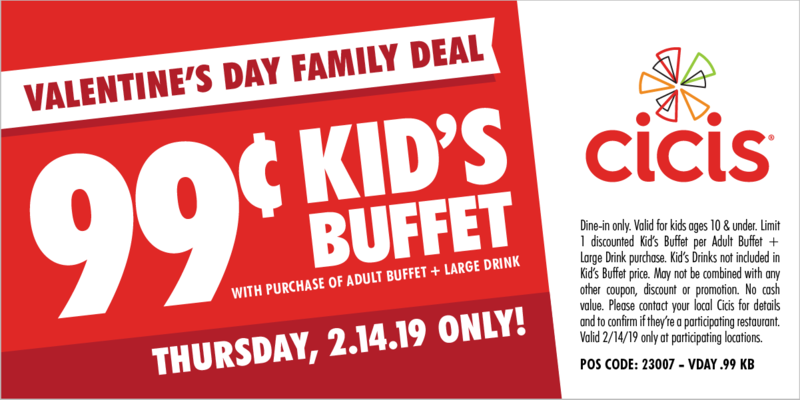 Cicis — Buy one adult buffet meal and a large drink, and you’ll get a Kids Buffet for just 99 cents with this coupon. Chili’s — Enjoy a $25 meal for two, including one appetizer, two entrees, and a dessert for sharing. Firehouse Subs — The sandwich shop will be offering a free dessert with any purchase this Valentine’s. Fogo de Chão — Get a full churrasco lunch, dinner, or Sunday brunch at Fogo de Chão February 14-17 and receive a complimentary dining card for a future churrasco lunch, dinner, or Sunday brunch that you can redeem between February 18 and May 2. Hooters — This anti-Valentine’s deal is perfect for those suffering from heartbreak. Destroy a photo of your ex, and get 10 free boneless wings with the purchase of 10 wings. Jack in the Box — Order via the app and you can get a free dessert (churros, cheesecake, or regular shake) with your meal this Valentine’s Day. Macaroni Grill — Enjoy a special 3-course prix fix menu for two for just $45 at the Spring location. Enjoy choices of Crispy Artichokes, Stuffed Mushrooms, Salmon, Braised Lamb Shank, Chicken Parmesan, and more. McAlister’s Deli — As a special for Valentine’s Day, kids eat free at McAlister’s Deli for its Family Date Night. This is valid for up to two kids’ meals with purchase of an adult entree. For children under 12 years old. Dine in only February 14. Valid at participating locations. Schlotzsky’s — Schlotzsky’s locations nationwide are giving away 3 oz. bottles of their Schlotzsky’s Hot Sauce February 14 with any food purchase. STK — The popular steakhouse will be offering Valentine’s specials from February 14-17, including Big Eye Tuna Crudo appetizer ($24), Surf & Turf ($86), Ora King Salmon ($68), Lover’s Cheesecake for 2 ($18) and a Love Potion cocktail. Papa John’s — Get a medium heart-shaped pizza starting at $11 this Valentine’s Day. Papa Murphy’s — Take advantage of today’s heart-shaped “HeartBaker” take-and-bake pizza at all locations starting at $9. Get the “Sweetheart of a Deal” for $12 with HeartBaker pizza and Chocolate Chip Cookie Dough. Know of any other Valentine’s Day deals and freebies? Comment below to let us know.